The Tea-Horse Trade Route between the hinterland and Tibet evolved from the Tang-Tubo Silk Road. Actually, the trade ties between the Qinghai-Tibet Plateau and the hinterland began much earlier than the Tang Dynasty. During the Sui Dynasty, the emperor issued an edict for expanded trade ties with various states in the Western Regions. When Princess Wencheng married into Tibet, she brought along with her a large batch of materials and books, including a statue of Sakyamuni equal to the height of the Buddha when he was 12 years old, 360 volumes of sutras, 20,000 pieces of silk fabrics, 300 volumes of books on divination, 60 kinds of books on technology, medicine that could be used to treat 404 kinds of diseases and tea. Tea had already been introduced into Tubo, but the trade priority remained silks to satisfy aristocrats. What Tubo exported to the Tang Dynasty were mainly local products or gold and silk vessels transported from Central Asia. There is a legend in Tibetan historical records about the introduction of tea to Tubo: King Dorsum Monbuchi (676-704) fell seriously ill. One day, a beautiful bird came to him with a twig in its mouth. The king felt curious about this, and tasted the leaves, which he found very delicately fragrant. After being boiled with water, it became a superior drink. He ordered his liegemen to look for more samples of this twig. At last, they found it in the area inhabited by the Han people. They brought back the leaves to Tubo and the king soon recovered. Then, he ordered his liegemen to look for vessels carrying this drink, and they also found porcelain bowls in the tea growing area ruled by the Tang Dynasty. According to this view, tea and tea sets all came from the hinterland and were introduced into Tubo in the period about 676-704. Tea soon became a favorite of the Tubo people. The Tea-Horse Trade Route had already been opened during the Tang Dynasty, and tea finally became to rival silk as a trading commodity, with a flow of horses primarily going in the reverse direction. It can be concluded that tea-horse trade and the Tea-Horse Trade Route originated from the Tang-Tubo silk trade. Tea became popular among the common people as well as aristocrats; monks who could not eat while meditating also drank it. Finally, it replaced silk in importance. In the Song Dynasty the Tea-Horse Trade Route worthy of the name emerged. In the same period, the Song Dynasty wanted to organize a strong cavalry and get warhorses from Tibet and other areas inhabited by people of the Tibetan ethnic group. Meanwhile, copper cash was being used in casting weapons, so its use in trade was banned and an exchange of tea and cloth for horses emerged. This stimulated tea planting and increased output, and promoted the fast development of tea-horse trade as well. The Yunnan-Tibet Route started from Xishuangbanna, Simao, Pu'er, Lincang, Baoshan, Dali and Lijiang in Yunnan, and then went up along Jinshajiang River from Shigu in Lijiang to Ludian, crossed the narrow pass of the Lidiping Snow Mountain to Weixi City, paralleled the Lancangjiang River to Yanwa before crossing the Prince Snow Mountain in Yanmen Valley to Yanjain, Tibet's Mangkang, Zukung, Bamda and Qamdo, and then went on to Lhasa through two routes in the south and north respectively. Among them, Lijiang, Diqen and Qamdo were important reshipment center and joints. Two Sichuan-Tibet Routes were in the south and north respectively. The southern route started from Ya'an (in present-day Sichuan), crossed Erlang Mountain, passed through Kangding and Qamdo and brought tea bricks produced in Ya'an to Lhasa. Kangding and Qamdo were the most important transshipment centers. The northern route from Ya'an to Kangding passed through Daofu, Luhuo, Garze, Dege, Gyangda and Qamdo. Here, Garze, Dege and Qamdo were important transshipment centers. The southern route started from Kangding, passed through Yanjiang, Litang, Batang, Mangkang, Zukung, and Chaya to Qamdo. Then, from Qamdo, there were also two routes to Lhasa in the south and north respectively. The northern one passed Dingqen, Sog, Nagqu, and Damxiong (Damo). The southern one passed Nyingchi and Shannan, and then went directly to Lhasa. There were two Qinghai-Tibet Routes. One is the Tang-Tubo route that passed Qinzhou (Tianshui in Gansu in present day), Weizhou (Longxi in Gansu), Linzhou (Didao County), Hezhou (Linxia, or passing Lanzhou to Shanzhou), Shanzhou (Ledu in Qinghai in present day), Chilin (Sun and Moon Mountain), Dafeichuan town (Xuerengui town, Qiejigu town), Qiabuqia in Honghe County, Daheba, Yushu, Chawula pass of Tanggulha mountain, Sog, Nagqu, Yangbajain, and Lhasa. The other one was a post route in the Yuan Dynasty, which started from Lintao in Gansu to Xining and Yushu in Qinghai, to Dege in Sichuan, Tibet's Qamdo, Sog, Nagqu and Damxiong, passing Yangbajain, and going on to the Xigaze area or to Lhasa directly. Among them Hezhou, Lintao, Yushu, Qamdo and Damxiong were important junctions. From Lhasa to South and Central Asia, there were three Tea-Horse Trade Routes: one started from Lhasa to Yadong through Shannan and Gyangze; another from Lhasa, Xigaze, Sagya, Lharze, Tingri, Nylam, Zam to Nepal; and a third through Xigaze, Sagar, Zada, Ritog and Liecheng (Ladakh) Kashmir, and then on to Pakistan, Afghanistan and other places. The passage from Xinjiang to Tibet might well be called the Salt Route or Musk Route in the Tubo period. As Yutian jade was carried to Tibet also through this passage, it could also be described as the Jade Route. The name of the Tea-Horse Trade Route did not accord with the reality completely. Although the tea trading was carried out, there was no characteristic tea-horse trade. 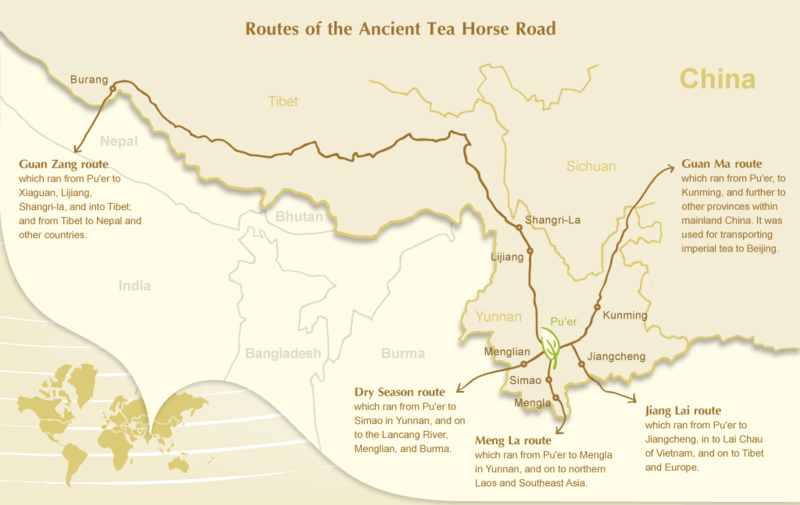 Thus we do not agree with some scholars on calling this route as the Tea-Horse Trade Route. In the period of the Tang Dynasty, the Qinghai-Tibet and Yunnan-Tibet Routes were very busy, while in the Song Dynasty, both the Qinghai-Tibet and the Sichuan-Tibet Route were important. During the Ming and Qing dynasties, the Qinghai-Tibet, Sichuan-Tibet and Yunnan Tibet Routes all developed together. Until the period of the Republic of China, the Sichuan-Tibet and Yunnan-Tibet Routes were developed continuously, and especially during the Anti-Japanese War, the Yunnan-Tibet Route played an important role. Tibetans say, "we would rather have nothing to eat for three days than having no tea for a day." Common people longing for tea in Tibet and other areas inhabited by people of the Tibetan ethnic group all drove their horses to trade. There were two ways: one was that leaders in Tibet and other areas inhabited by people of the Tibetan ethnic group paid tribute in horses to the imperial court in return for tea, silks and other precious gifts. As the imperial court usually awarded more and got less, many came to pay tribute in horses in a continuous stream. The other way was that numerous businessmen of various ethnic groups built up an intermediate trade of exchanging horses for tea to gain enormous profits. The Tea-Horse Trade Route was an economic route connecting the hinterland with Tibet, as well as a political, religious and cultural route. Even in the period of the Song Dynasty and the Ming and Qing dynasties, after the tea-horse trade prospered and major local trade between the hinterland and Tibet, the business on the Tea-Horse Trade Route broadened, and silks were also important goods. Other goods transported from hinterland included: cloth and silk textiles and harnesses. The goods transported from Tibet also included wool and sheepskin, oxtail, carpet, pulu, musk, medicinal herbs, etc. Even King Gesar says, Goods are transported from the Han area to Tibet. Is it because these goods cannot be produced here? No. It is nothing but connecting people's minds in Han with that in Tibet. These words reflect vividly the impact of the tea-horse trade in people's lives as well as its active role in furthering ethnic friendship between Tibetans and Han people and promoting ethnic harmony. Because the tea-horse trade was related to border stability and the national economy and people's livelihood, as well as having great market potential and profits, the Central Government from the Song Dynasty onwards attached importance to it; organizations managing these affairs also emerged, as well as a tea policy and horse policy, which were combined with the administration of Tibet. To cope with the growing trade with Tibet, the Song court set up special organs to deal in tea. Tea offices were set up in tea growing areas. During the Ming Dynasty, tea-horse policy was greatly developed; tea-horse trade offices were set up in all districts, and the exchange rate of tea and horses was also stipulated: one best-quality horse for 60 kg of tea; one mid-quality for 35 kg of tea and one foal for 25 kg of tea. Private trade was forbidden. Gold plates were granted to the heads in Tibet and other areas inhabited by people of the Tibetan ethnic group, inscribed with the Emperor's Edict at the top, "For Official Errand" on the left and "anyone committing an offence should be beheaded" on the right. The Ming court also actively tackled offences in the tea-horse trade. It was stipulated that anyone who exports tea privately is guilty of a crime worthy of death. But it was still difficult to prevent some businessmen and officials trying to profit in this way. Zhu Yuanzhang's son-in-law Ouyang Lun, for example, did so. When his activities were disclosed, Zhu Yuanzhang placed righteousness above family loyalty and killed this emperor's son-in-law. According to some records, all professional horse caravans before liberation had a rigorous organization including three grades of No.1 Guotou, No.2 Guotou and Guanshi. 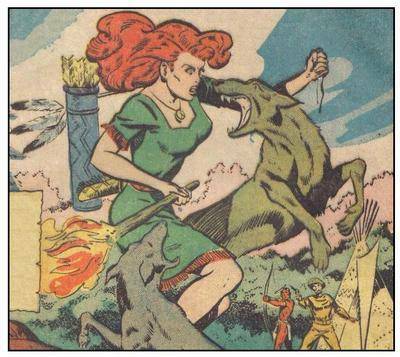 Daguotou was head of the whole caravan and was brave and resourceful, familiar with business information, folk customs and road posts, and could manage household and financial affairs such as managing housekeepers, beasts and property. The size of the horse caravans differed according to the number of beasts. Five beasts constituted a bundle, five bundles constituted a small caravan with a small Guotou in charge. One caravan had scores of beasts, and could have hundreds or even thousands. There was one driver to four mules and horses. (See Shen Xu: The Tea-Horse Trade Route-a history once disappeared). As the Tea-Horse Trade Route was long, dangerous and rough, people making the difficult journey on the ancient roads year in and year out showed fortitude and an adventurous spirit. But in their hearts was hidden some bitterness that could not be exposed to others. There was a saying in horse caravan business that "the money earned on this route can be enjoyed by nobody but parents." During the period of World War II, when Japanese imperialists invaded China, the horse caravans and heads of tea houses on the Tea-Horse Trade Route made a great contribution. 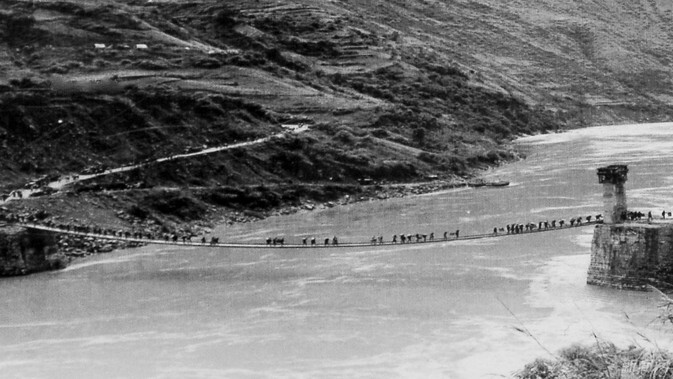 After Burma (Myanmar) was occupied by the enemy, in order to prevent the invasion of the Japanese army to the east of the Nujiang River, the Chinese army bombed Huitong Bridge to cut off the unique international road in the southwest area, the Yunnan-Myanmar Highway, and the Tea-Horse Trade Route took on new importance. The materials for the battle supported by overseas Chinese and allied forces including arms and ammunition were brought from India continuously to China by horse caravans. 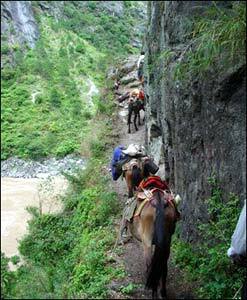 Members of the horse caravans came from the Tibetan, Naxi, Bai and Han ethnic groups. They were not only partners in business but also comrades-in-arms in the Anti-Japanese War. Many more horse drivers joined the army directly and became soldiers, being familiar with the terrain and roads, and able to shoot and fight with great bravery. At that time there was a popular song, "Horse bells jingle all the way, and horse Guotou are full of mettle. Don't do business this year and carry guns to fight for the country." In north-east Burma another border battle is taking place, and the Japanese vanguards thrusting up the Burma Road are 60 miles to the west of Paoshan, 200 miles inside the Yunnan border. The Chinese have destroyed the bridges across the Salween River and are holding the east bank. Small parties of Chinese appear to be operating in many directions up the Burma Road, and guerilla warfare stages appears to have been reached. "On and on it went. The whole thing is so familiar to me. No mention of the A.V.G., who were the one who had destroyed the large bridge across the Salween by dropping bombs." "Thousands of refugees fled down the tortuous Burma Road toward Kunming, China to escape the advancing armored forces of Imperial Japan. 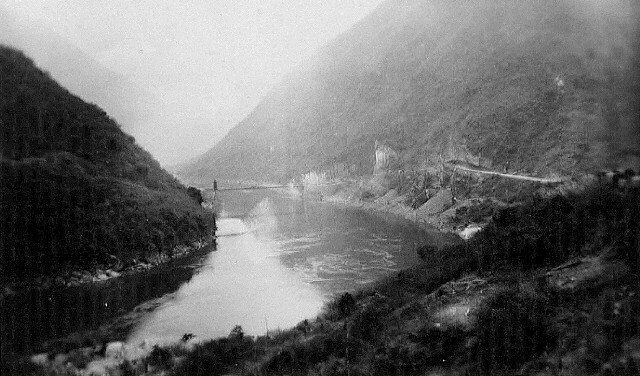 With the armies of china devastated, it was evident that nothing but the winding Salween River at the bottom of the treacherous gorge could slow the enemy's surge toward the capitol city. After destroying the bridge behind them, those fleeing watched helplessly as the Japanese hastily started to construct a makeshift pontoon bridge. It appeared that China would face certain surrender if the enemy made it across. 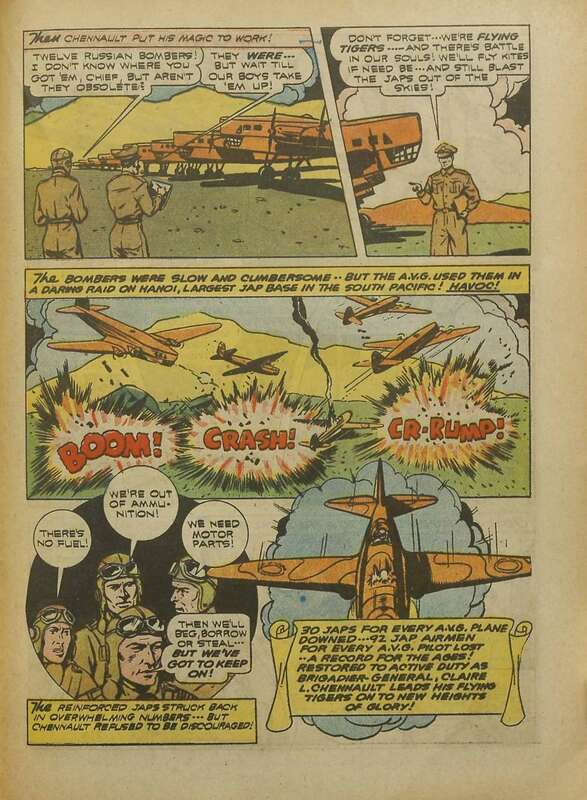 Hopes of an easy victory quickly began to fade through, when suddenly through the gorge rang the echoes of snarling Allison engines, powering shark mouthed P-40s of the legendary American Volunteer Group, better known as the Flying Tigers! 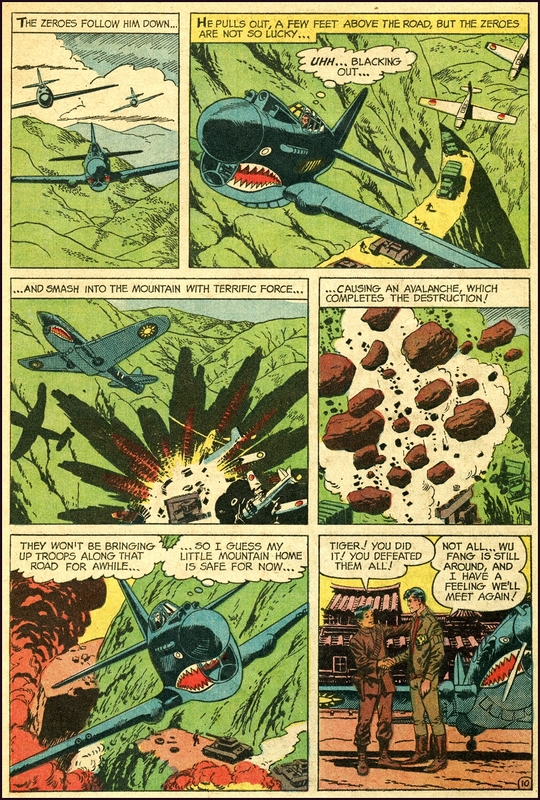 With 'Tex' Hill leading the charge, and with only a handful of men and planes, the AVG stopped the Japanese cold in the Salween River Gorge, and China would not fall."